All congregations in the SA-NT District are invited to attend next year’s Growing Young Conference, an event that will address how churches can become more effective in their ministry to young people. The conference will be led by guest speaker Jake Mulder from the US, who is the co-author of the book ‘Growing Young’. It was this book that St John’s Tea Tree Gully Pastor Eugene Minge took to the congregation’s leadership group a few years ago. It led to St John’s applying for a Mission Stimulus Grant to bring Jake Mulder to Adelaide. This application was successful and announced at the SA-NT District Convention of Synod in May. Pastor Eugene said he had connected with the book, which focuses on six strategies ‘to help young people discover and love your church’. Tea Tree Gully doesn’t have a large number of youth and has a gap from high school kids to people aged in their 30s. A change that has come as a result of ‘Growing Young’ at Tea Tree Gully has been the relationships that have developed between the old and the young. Recently some youth helped clean up on a property that some of the older members were connected to, while others carried out some iron work on an older member’s forge. “It really has built some bridges,” Pastor Eugene said. “In trying to put these strategies in place, we’re actually seeing some really good relationships develop, which is largely what it’s about. 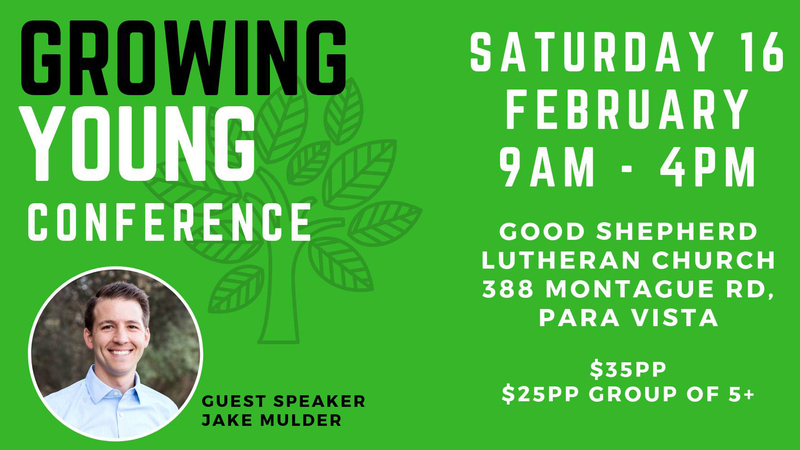 The Growing Young Conference will be held at Good Shepherd Lutheran Church, Para Vista, on February 16. It will run from 9am to 4pm.